Seggiano rises on a buttress placed along the north-western side of the Amiata mount. It was founded at the time of the Etruscans and it is set amidst beautiful landscapes. Among the most important monuments to see in Seggiano we point out here the Santuario della Madonna della Carità, the Chiesa di San Rocco, the Parrocchiale di San Bartolomeo and the Castello di Potentino. Near Seggiano is the Giardino di Daniel Spoerri, a sculpture garden by the artist Daniel Spoerri. Just outside Seggiano, you ought to visit the Santuario della Madonna della Carità, an imposing building from the end of the 16th century with an elegant dome divided in different parts. The Santuario was built between 1589 and 1603 is important for the trachyte façade in Baroque-style and is characteristic for its Dome in red bricks. On the principal wall, the church has a fresco representing the Annunciazione and the interior hosts seven different kinds of altars. Nearby, a unique site is the Cappella di S. Rocco, a small chapel built in the 15th century and decorated with frescoes which were damaged by some uncivilised soldiers in 1488 who left their signatures on the walls. The Palazzo Comunale contains a polyptic by Martino di Bartolomeo, depicting a Madonna with Child. In the Chiesa di San Bartolomeo, built in the 13th century, several works by Ugolino Lorenzetti and frescoes from the 15th century. The interior, with three aisles, houses a very interesting work of art on the high altar. It is a polyptych which has three elegant niches depicting La Madonna col Bambino in trono e i santi Bartolomeo, Giovanni Evangelista e Michele Arcangelo (Madonna and Child on the throne and St. Bartholomew, St. John the Evangelist and the Archangel Michael). The polyptych was attributed to the Sienese painter Bulgarini and dates back to the Middle Ages. Going up towards the top of the village you find the Chiesa del Corpus Domini, where you find a reliquary which belonged to St. Bernard of Siena and some precious paintings of the Sienese school. Just a few kilometres from Seggiano, on the western slopes of Poggio Ferro, you can find the remains of the old Franciscan convent of Colombaio. Nowadays only the ruins of the structure are visible, partially covered by vegetation. Pescina is a village in Tuscany, central Italy, administratively a frazione of the comune of Seggiano. Pescina is about 62 km from Grosseto and 5 km from Seggiano, and it is situated along the Provincial Road which links Seggiano to the top of Mount Amiata. The village is known for its typical dish, sugo di scottiglia alla pescinaia, a sauce with a mixture of beef, pork, chicken, turkey, rabbit and lamb. San Lorenzo Martire, main parish church of the village, it contains a Madonna col Bambino by Luca di Tommè. Giardino di Daniel Spoerri, a contemporary sculpture garden founded by artist Daniel Spoerri in 1997. At the beginning of the Nineties the Swiss Artist Daniel Spoerri established a sculpture garden in the South of Tuscany, Il Giardino di Daniel Spoerri. It has been opened for the public in 1997 and can be visited from Easter until October. There are 87 installations by 42 artists in an area of about 16 ha. The name „Il Giardino“ derives from its geographical position. On old maps the place is called “Il Paradiso”. Thus it is a “Garden of Eden”. Regarding the structure of the landscape it is not as poor as the hilly area around Siena with its isolated cypresses. There slopes of the Monte Amiata - the highest mountain of Tuscany - is densely wooded. The landscape is very different from the typical Tuscan views that we usually see in calendar pictures. Tue - Sun : 11a.m. to 8p.m. daily : 11a.m. to 8p.m. Tue - Sun : 11a.m. to 7p.m. The most important and famous product in Seggiano is the olive oil of the olivastra seggianese D.O.P. The olivastra is a kind of very resistant olive tree which produces a type of olives that gain a very dark color when matured. This olive oil comes from old aged olive trees which have been on the Monte Amiata since the Etruscan Age. The olive oil of Seggiano, famous in north and central Italy, has ancient origins. In the Middle Ages the Olivastra, native to the district of Seggiano, was planted by the Benedictine monks. The Olivastra is a hardy variety that is unique to that area. Protected by the mountain's cold winters from infestation by the olive fly, the trees can be cultivated without pesticides. But the main characteristic that sets the olivastra apart from other Tuscan varieties is its very sweet taste. The area of production of Consorzio di Seggiano extends over the municipalities of Arcidosso, Castel del Piano, Seggiano, Cinigiano, Santa Fiora, Roccalbegna, Semproniano and parts of Castell'Azzara's territory. There are several are the events organized in the area of production to taste this delicious olive oil. Very important is the festival of Olearie, the annual oil festival is held on the first Sunday of December. In Vivo d'Orcia, where the woods of Monte Amiata give way to rolling hills of the Val d'Orcia, not far from the town, there is the Hermitage del Vivo, a late-Renaissance building overlooking the valley below. The valley that leads to the hermitage is one of the most impressive in all of the Amiata area. The name "Vivo" (meaning "Alive") was adopted because of the lively, powerful industrial heart and from the wild and crashing river Vivo that ran through the village's six water-mills, once used for iron-works, olive crushing and fine paper production. Surrounded by vegetation, Eremo del Vivo also known as the Contea, is characterized by the presence of the imposing Palazzo Cervini, a fortified building on a plan by Antonio da Sangallo. The construction of Palazzo Cervini was commissioned in 1538 by Cardinal Marcello Cervini from Montepulciano. An old stone bridge covered in moss with the name Ponte degli Innamorati (lovers' bridge) marks the entrance to this romantic property. To the right is the castle, which is still lived in by the by members of the family. To the left is an arched stone doorway leading down to the hamlet which in the past housed the peasants and their families. Not far away from here, in the vicinity of the historic springs of Vivo is the church of the Ermicciolo, a wonderful example of the Amiata Romanesque architectural style. The Mushroom and chestnut festival (Sagra del Fungo e della Castagna) takes place in late October in Vivo d'Orcia. Various competitions, buffoonery and so on take place, and there is a nature walk where mushroom species are explained, but the main attraction is the range of local porcini mushroom dishes available, and the sale of porcini and chestnuts. Vivo d'Orcia is a frazione of Castiglione d'Orcia. The construction of Palazzo Cervini was commissioned by Cardinal Pope Marcello II and the work was completed in 1538. The design and construction was undertaken by Antonio da San Gallo (Junior) who was specialized in the construction of fortified buildings and had been involved in projects for the Vatican. Cardinal Marcello Cervini became Pope Marcello II on April 10th 1555 but sadly passed away after just 22 days after having suffered an apoplectic fit. Curiously, he was an unpopular figure in the Vatican due to his humility and the lengths that he went to distribute the wealth of the church back to society and the common people. He could almost be considered an early socialist and his views appear to have been shared by his architect Antonio Sangallo who designed the estate without displaying the usual frills of Papal power. Both Pope Marcello II and Antonio Da Sangallo had what can only be termed as being socialist attitudes and the entire design of the estate reflects this somewhat. There is a notable absence of elaborate features and the facade takes on a reverently humble feel, with the aim of presenting the Pope's living quarters to the local population in an open and friendly style. This approach contrasted dramatically with other Papal homes of the period and indeed with the Vatican, whose objectives, up until that time, were to stun and overwhelm society with elaborate features, expensive building materials architectural prowess. The sudden death of Pope Marcello II did not prevent the family from establishing a paper processing workshop within the grounds, in 1774 driven again by a water mill. Fed by the spring water and using the abundant timber of the volcano’s forests it was soon manufacturing one of the highest quality writing papers in Europe of it’s day. This fine quality paper was subsequently used by the Vatican. In the sixteenth century, the property passed to the family Cervini, along with the title of County. It is precisely in this hermitage where you can find the maritime pine tree, which much to everyone's surprise, is able to live 1,000 meters above sea level. According to legend, it is here that a groom, who was madly in love with the Countess of Cervini, declared his love to her and gave her the pine, which has managed to survive in this cold environment thanks to the power of love. The 16th century Hermitage (or Eremo) was established by Pope Marcello II in order to house the humble yet industrious order of hermit monks, known as the Camaldolse. As well as being a quiet order that searched for close contact with nature, they also discovered many medicinal plants from the surrounding Tuscan countryside. The skills and life philosophy of the Camalsolse monks appear to have been respected by the architect Antonio da Sangallo, who established the Hermitage to stand as a testament to the social concept of the Camaldolese and be a reflection of the humble nature of certain facets of the Modernist Catholic movement. Therefore, the structure lacks the elaborate detail and luxurious materials so often used in the construction of Papal dwellings- making the Hermitage amongst the first of its kind in the Renaissance period in Italy. The Ermicciolo hermitage was established at the beginning of the XIIth century in the centre of a magnificent chestnut grove. The Ermicciolo is a small Romanesque church with some nineteenth century reconstruction and evocative decorations consisting of small columns on the façade and suspended arches in the apse. It is also used as the Cervini family tomb. Close by, lies the spring of Sorgente del Vivo which, since 1934, has supplied water to Siena and it's environs, including the Amorosa. The ancient Castle of Potentino lies between Castel del Piano and Seggiano, at the base of Mount Amiata. Castello di Potentino situated near Seggiano, in the province of Grosseto. The original foundations of Castello di Potentino are probably Etruscan. Over the centuries the property passed through the hands of many well-known Tuscan families of noble descent - the Tolomei, the Bonsignori, and the the Salimbeni, whom in the company of Contessa Bianchina, received Saint Catherine of Siena as a guest at the castle. At the end of the 16th Century it became a centre for the charitable works of the hospital order of Santa Maria della Scala. Recently it was purchased and restored by the Greene family, who have owned properties in the Tuscan Maremma for over 30 years. In 1989 the family purchased their first ruined castle – the Castello di Montepò in Scansano. The Castello di Montepò, a medieval fort with 500 hectares of land and about 60 hectares of vineyards, was sold to the well-known wine producing family of Biondi Santi. Castello di Potentino is the second major project of the Green family in the Grosseto area. Charlotte and Sally Green bought Potentino Castle in 1999, at which time it almost needed a complete reconstruction. During the restoration works, the Greens gave new life to the castle while maintaining the architecture and social history. The Green family now produces Montecucco DOC Wine, Olive oil and Grappa. Their wine, Sacromonte Montecucco Doc won the awards in 2004 and 2005 as the best wine from the "Gambero Rosso", one of the most famous Italian wine guides. The Montecucco Wine Trail runs through a vast area situated on the slopes of Mount Amiata, which has its centre at Cinigiano, lying between the Maremma region and Amiata. The chef of Il Silene in Seggiano is Roberto Rossi, whose restaurant is considered by many as the best restaurant in the Montalcino area. The name Silene derives from the name for a flower also called strigolo in Italian, called the Bladder Campion. This name comes from the ancient name "Silenus" of the accompanier of Bacchus (probably because the flower of the plant looks like the chalice). Silene is also used in the cuisine. The young shoots and the leaves are used as food. The tender leaves may be eaten raw in salads. The older leaves are usually eaten boiled or fried, sauteed with garlic as well as in omelettes. Seggiano borders the following municipalities: Abbadia San Salvatore, Castel del Piano, Castiglione d'Orcia. Podere Santa Pia sits on a hill overlooking the Maremma countryside in southern Tuscany, and it offers absolutely everything that any of your senses would want of a Tuscan vacation. Enjoy the exquisite art, museums and churches in the nearby cities, then relish the cuisine and epic countryside. Podere Santa Pia highlights the best of the quintessential Italian region. A Romanesque chapel and an extensive hermitage (Eremo) were also constructed to accommodate for a fascinating group of humble monks, known as the “Camaldolesi”, who first inhabited the caves that now form the foundations of the castle in 1,004 ad (500 years previously). Along with this impressive estate the church established one of the largest and finest industrial centres of the 16th century, way surpassing anything built up until that time. Comprising of 6 large water mills, several huge and elaborate marble tanks, for cleaning and preparing the paper pulp, the estate soon lived up to its name “Alive” by becoming the only industrial centre in the whole region, vital for crushing olives, smelting iron tools and producing one of the finest quality writing papers in Europe of its day. Very few houses are clustered around the XVI century Palazzo Cervini and the church of San Marcello. We proceed going back to the stone arch without crossing the stream, turning left on a footpath that starts at a gate and some stone steps that climb up to the fir-woods. From Vivo d'Orcia to Castiglione d'Orcia. This naturalistic route is completely immersed in the beechwood groves on Monte Amiata. 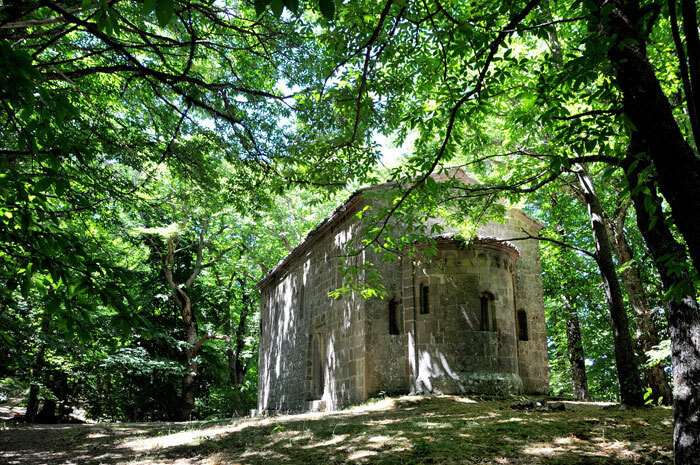 Discovering the Eremo del vivo, a pitturesque and romantic hermitage, is a moving experience. A short way from the centre of Vivo d'Orcia is the Eremo del Vivo (or County), a palazzo of late Renaissance form designed by Antonio da Sangallo the younger. From the sources of the Vivo reservoir, which supplies Siena and Val di Chiana, an ascent among beech and chestnut trees leads to the little church of Ermicciolo and the characteristic drying rooms or, as some experts put it, the first inhabited nucleus of Vivo d'Orcia. Kompass nr. 653, Pienza - Montalcino - Monte Amiata, 1 : 50.000 or Edizione Multigraphic/Provincia di Siena, Val d'Orcia, 1 : 25.000. There are a few brochures and books available in Podere Santa Pia, with more information and walking tracks: Amiata without haste... By foot (Itineraries), Amiata by bike (Itineraries) (see itinerary 9), Amiata senza fretta... a piedi (itinerairies 9.1 and 9.2).